You can create a bouquet of Roses, for use as clip art in e-cards, using Microsoft Paint and many other photo/art editing programs. 3. Arrange all of your Roses into a full bunch. Do not try to get each flower to show completely. Offset them to create a multi-dimensional image not a flat one. An even dozen makes a good round number. Draw a stem for each flower. 2. Use a program such as Corel Paint Shop Pro, or Adobe Photo Shop to copy and change the angle of the flower by using the straightening tool. 4. Draw a nice Vase and add some greens to fill in and cover all the bare areas. Baby's Breath, because of the tiny green leaves and white flowery buds, makes a very good choice. A fact most Florists agree on! Baby's Breath represents purity of heart, sincerity and everlasting love. * Do a little research to find the color meaning of Roses before settling on your choice. You don't want to convey the wrong sentiment. For example, don't send your loved one yellow roses. Yellow roses represent joy and friendship, while Red roses are the traditional symbol for love and romance. 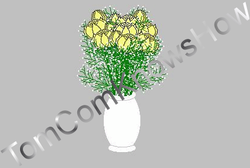 * In MS Paint, remove the check next to 'Draw Opaque,' so you can overlay your petals and flowers without blocking out any of the image. * Whatever program you use to change the angle, make the changes minimal to avoid too much blur. * It was brought to my attention that the cover image had been used repeatedly without my permission, violating my copyright, thus explaining the need to apply a watermark. Enlargement of the same image in step 4 has been prevented. Content thievery hurts us all!